Marsh tea is an evergreen shrub; the rust-colored, woolly branches bear alternate, leathery, linear leaves that are green and glabrous on top and covered with rust-colored down beneath. Terminal umbels of white, or sometimes rose-colored, bell-shaped flowers appear from May to July. 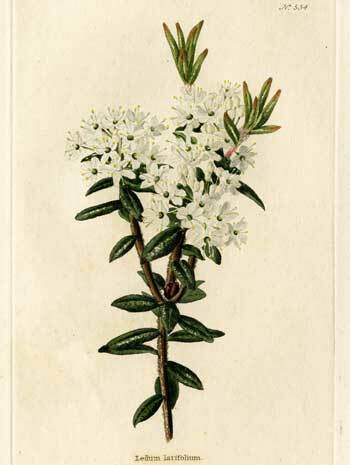 This species is called both Labrador tea and Marsh tea; it is an evergreen shrub; a low ornamental plant from 1-6 feet high, having narrow, dark leaves lined underneath with rust-colored woolly hairs and bearing white, bell-shaped flowers in early spring. During the American Revolution the leaves are said to have been used as a substitute for commercial tea. 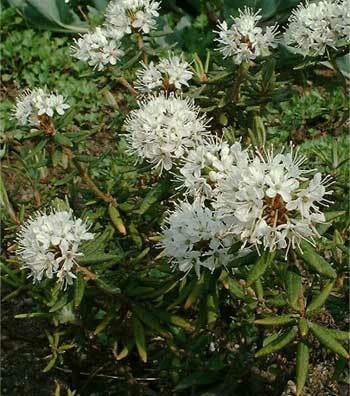 Labrador tea is an evergreen shrub; growing 3 feet high, the leathery leaves are fragrant, oblong or linear-oblong; white or rusty woolly hairs underneath; edges turned under. Small white flowers in terminal clusters from May to July. 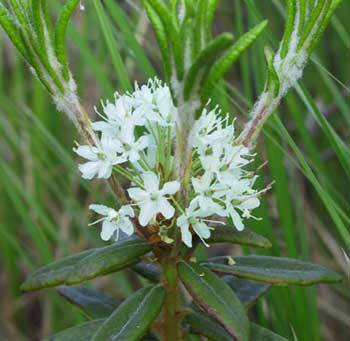 Grows particularly in peat bogs and moist places in the northern areas of North America, Europe, and Asia. It is sometimes cultivated as an ornamental. Common to North America and is found as far south as Wisconsin and Pennsylvania. Found in peat soils, bogs; from Labrador to New Jersey; Ohio, Michigan, Wisconsin, Minnesota; across Canada to Alaska. Used externally, marsh tea makes a good remedy for all kinds of skin problems, boils. Internally, it stimulates the nerves and the stomach, headache. An infusion or cold extract is used for rheumatism, gout, and arthritis. A syrup made from marsh tea is sometimes used for coughs and hoarseness. Useful for colds, asthma, bronchial, tuberculosis, and pulmonary problems. Externally, used for eczema, acne, erythema nodosum, gout, rheumatism, stings, tetanus, tinnitus (ringing of the ears), wounds, boils, bruises, deafness, ear inflammations, prickly heat, scabby dandruff. Native Americans used the leaf tea for asthma, colds, stomachaches, kidney ailments, scurvy, fevers, rheumatism, blood purifier. Externally, used as a wash for burns, ulcers, stings, chafing, poison ivy rash. Folk remedy for coughs, lung ailments, dysentery, indigestion; used externally for leprosy, itching, and to kill lice. Infusion: steep 1 tbsp. dried leaves or herb in 1/2 cup boiling water. Take 1/2 cup per day. Cold extract: Soak 1 tbsp. dried leaves or herb in 1/2 cup cold water for 10 hours. Take 1/2 cup per day. Decoction: 1 oz. tea to 2 pints boiling water; drink as required, a mouthful at a time. All varieties: Excessive doses can cause poisoning.